Posted by Eddie & filed under Travel, June 18 2007. During my trip to the Canadian Rockies, the weather was all over the place and unpredictable – very Scottish in fact. This winter’s snowfall was larger than normal, but when Lesley and I arrived, western Canada was having an unseasonal heatwave. We got five days of this glorious weather, but for the rest of the trip there was a lot of rain, some of it in large thunderstorms. British Columbia had severe flooding problems and Edmonton experienced damaging hailstorms and at least one tornado. The town of Canmore was on a flooding emergency alert. All of this meant that the water levels in rivers in the Rockies when I visited were exceptionally high. The prolonged warm spell earlier in my trip had created a large snowmelt on the mountains and this was then added to by all the rain. Spring is not a good time to go hiking in the Canadian Rockies, as I was to find out – something I’ll describe in another blog posting. All this weather did mean however that this was a very good time to visit waterfalls in the Rockies and this is what Lesley and I did. Huge torrents of water that were the colour of very milky tea (due to the rock flour carried in the rivers) poured noisily over these falls and made each one an awesome sight. The waterfalls in the Rockies are all spectacular, and it really is odd that Scotland has nothing to compare; it’s a rainy and mountainous country, but the falls it does have are small compared to places like Canada, Iceland and Scandinavia. One of my friends, Ian, has a wife who is from Norway, and upon seeing the Falls of Dochart at Killin in Perthshire for the first time, she promptly burst out laughing. Having visited Vøringfossen in Norway, I can understand why – the ‘Falls’ of Dochart are pretty pathetic in comparison (they’re rapids, really). Tangle Creek Falls, Jasper National Park. These falls are right on the Icefields Parkway near the Columbia Icefield and cascade over rock shelves through the trees. This creek caused me problems hiking as I’ll describe in a future blog posting. Photo here. Sunwapta Falls, Jasper National Park. 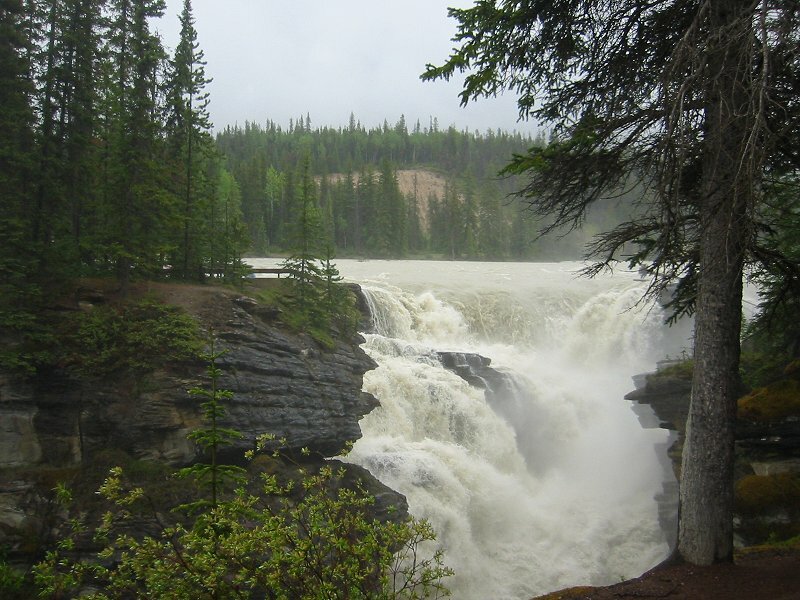 These falls are a short drive from the Icefields Parkway about halfway between the Columbia Icefield and Jasper, and are a good place to see the Sunwapta River in full spate. Photo here. Athabasca Falls, Jasper National Park. 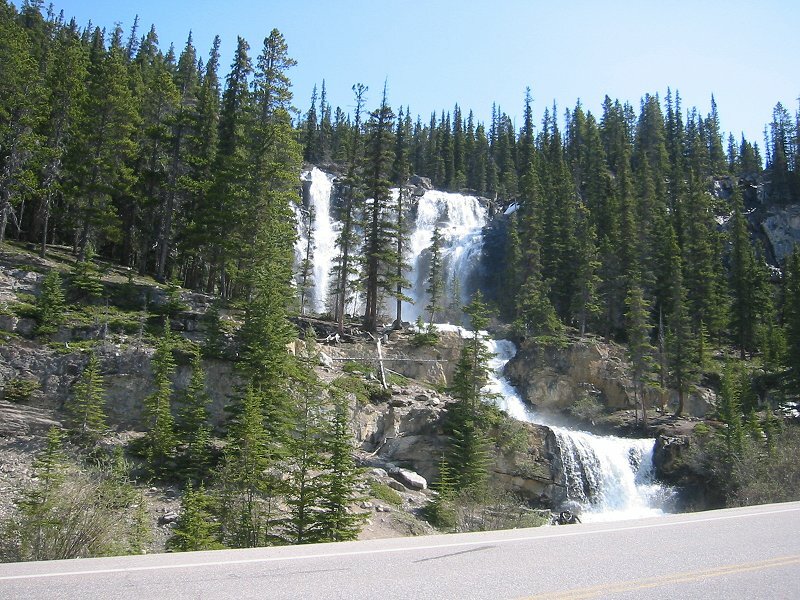 These falls are also a short drive from the Icefields Parkway near the town of Jasper. Lesley and I visited them in the pouring rain which is really the best time to see falls like this. Huge amounts of water crashing over the falls made it really impressive, and also interesting were the dry crevices in the rock that were carved by previous incarnations of the falls but from which it has since moved on. Photo here. 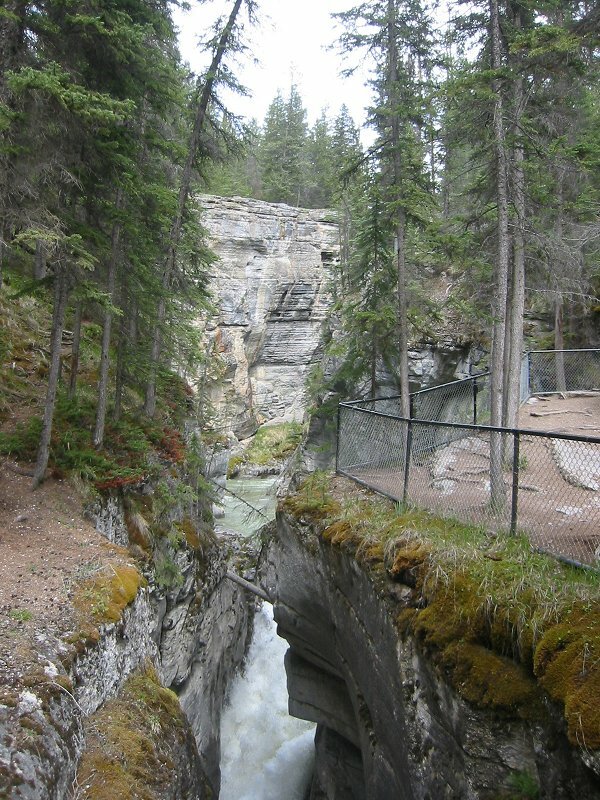 Maligne Canyon Falls, Jasper National Park. This canyon not far from the town of Jasper really is a remarkable place – it is so narrow in places that you feel that you could almost jump across, but incredibly deep. It’s like a scary pit in the middle of the woods that you could easily fall into if you didn’t know it was there (and if there wasn’t nice tourist-friendly fencing around it). The Maligne River roars through the canyon almost out of sight far below. Deep within the canyon lurked a thick snowbank. Photo here. Weeping Wall, Banff National Park. 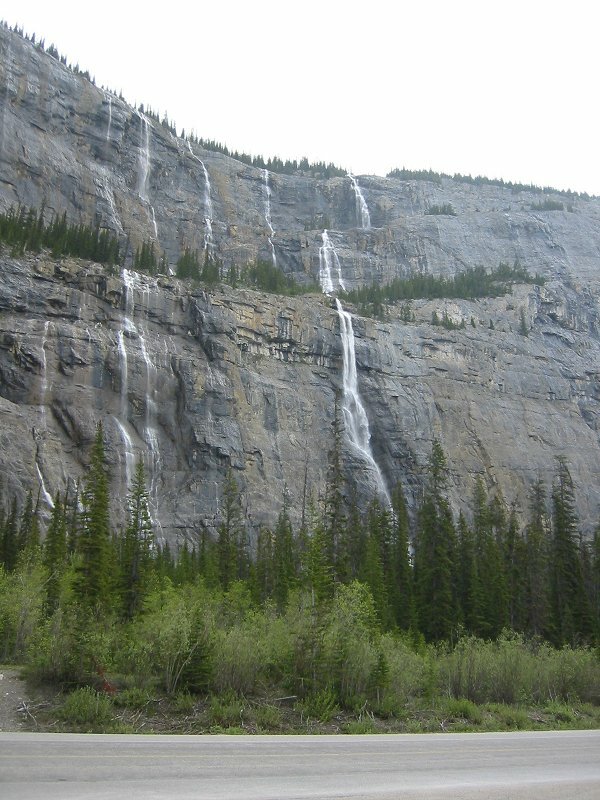 This is right on the Icefields Parkway near the Sunwapta Pass and is very tall, with ribbons of water falling down a sheer rockface. Photo here. Natural Bridge, Yoho National Park. As noted in the previous posting ‘Canadian Rockies #2; Yoho & Kootenay National Parks, Golden, Canmore & Calgary‘, we couldn’t visit Takkakaw Falls in Yoho (the second highest in western Canada) due to a road closure, but we did see this a short distance from the Trans-Canada Highway on the road to Emerald Lake – the Kicking Horse River has carved its way right through a block of stone to create a natural arch. Wapta Falls, Yoho National Park. These were possibly the most spectacular falls we saw. It was a 40-minute hike from the Trans-Canada Highway to get to the viewing point, and this meant that most tourists do not bother going and we pretty much got the falls to ourselves. 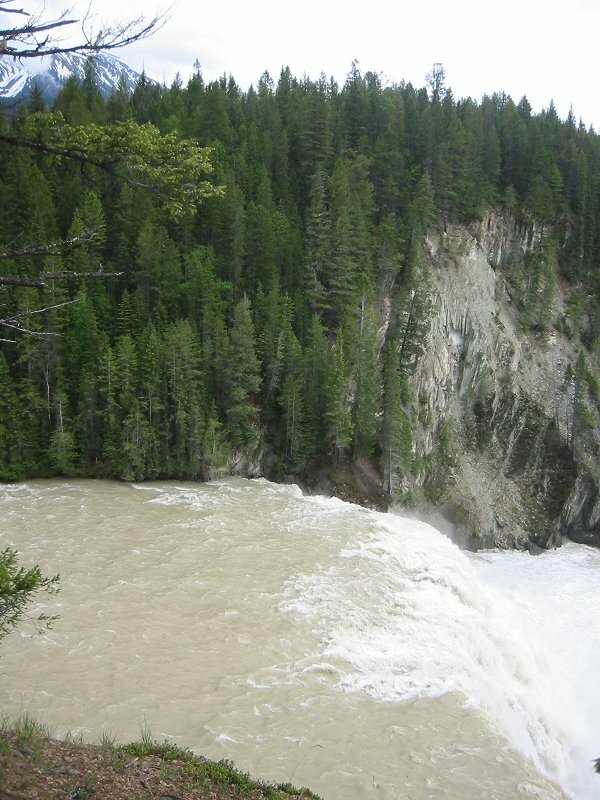 The Kicking Horse River flows widely through a large canyon and resembles a mini-Niagara. 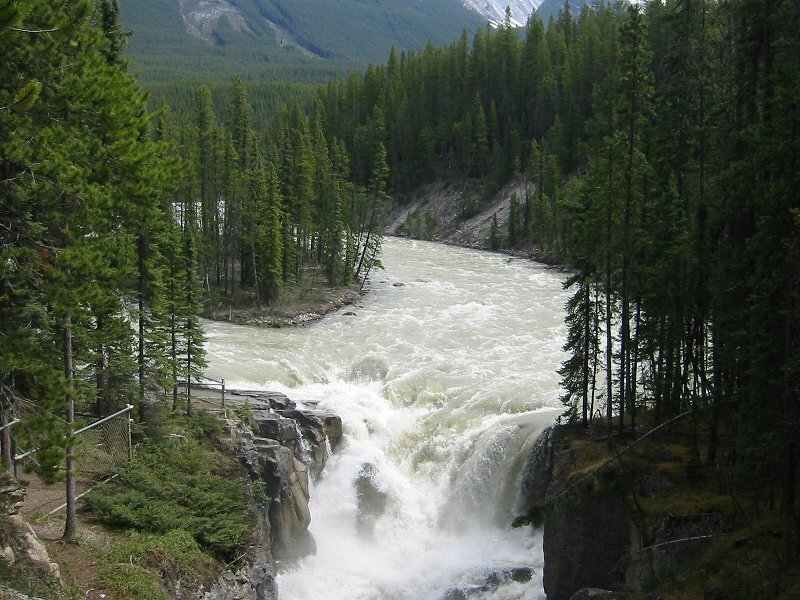 Wapta Falls are the largest falls by volume of water in the entire Canadian Rockies and the third-largest in the whole of Canada. Photo here. Of course none of these waterfalls really compare to Niagara Falls, which Lesley and I visited in 2004, and which is really in a class of its own. Being there is like watching some sort of continual natural catastrophe unfold before your eyes. Niagara Falls are odd in another way – this part of Ontario and New York State is actually fairly flat, so it’s doubly impressive to see such a dynamic marvel of nature that you might normally associate with mountains and precipices, in a seemingly innocuous landscape. Thanks for linking to me in your blog!